Firstly I have to say that I am rarely bored...if I'm not doing something my mind still is, it is for this reason I'll often watch a movie, simply to go on vacation from myself. With that said, yesterday was one of the infrequent times I can honestly say I became bored, but I believe you will understand...I was trapped at an airport terminal. It wasn't terribly long, just a bit over four hours...but it was my own fault (stupidly, when purchasing a ticket online I purchased it for p.m. thinking it was a.m., luckily I was able to get on another, but for hours later). Anyhow, it gave me time to think, read, nap, and listen to music (and drink too much coffee), but inevitably I became bored. I even read the label on my water bottle. I've long given up purchasing bottled water after learning that it is largely unregulated, but at an airport--where one is no longer allowed more than 3 ounces of liquid through checkpoint--you are quite literally at their mercy (not only with choices but also the exorbitant prices). With that said, when I reached for the water in the refrigerated case I chose the cheapest there was, and it was still nearly $3.00US. 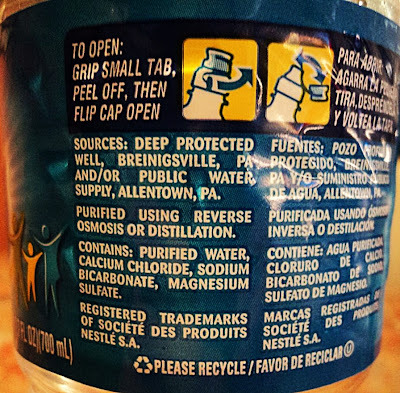 But before I go on with my observation I ask you, the reader, to observe for yourself...what do you see on either label that is either alarming or even sad (and yes, in the event you are wondering...I did get a few odd looks as I sat at a table taking picture of my bottle of water). Let's start with the top photo, the front label. "Purified Water Enhanced with Minerals for Taste." Mmm...mmm, getting thirsty yet? Now lets look at the lower photo, the back label (I consciously added quotation marks and italics because I feel that's how it should be more properly written on the label)..."Deep Protected Well" (huh?) And/Or "Public Water Supply." Well (and yes I see the irony of using that word) I think we know which And/Or it is, and we also know what "Public Water Supply" means...tap water. 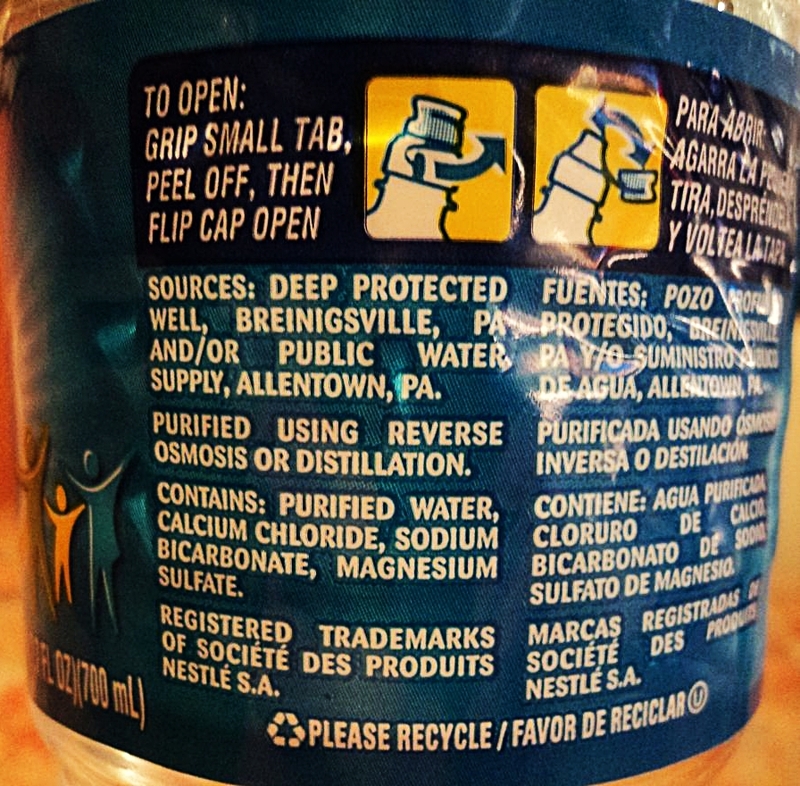 According to this site, nearly 50% of bottled water available in the US is nothing more than tap water. Later, as I was exiting a restroom (washroom for my friends north of the border, and WC for my friends "across the pond"), I see an elderly gentleman refilling his water bottle at a drinking fountain before he got on his flight. Well isn't that interesting, is what I must have muttered aloud. Because he turned to me and smiled before asking what I meant. I showed him the label on my half-consumed bottle. Yes, he told me, still smiling as he capped his bottle...it's a scam. Yes it is, I said. We both wished each other a safe and comfortable flight, and then I uncapped my bottle to refill it straight from the tap...it was a much better deal. 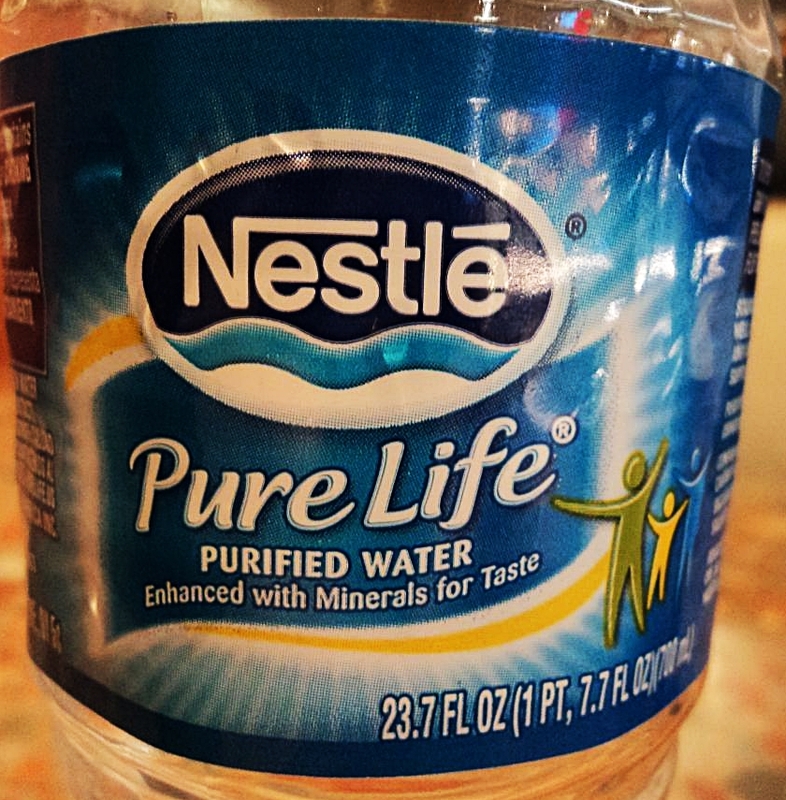 "Purified Water Enhanced with Minerals for Taste." I'm still scratching my head over the concept of enhanced purity, by means of adulteration no less. Reminds me of that famous Oscar Levant quip about Doris Day. "Deep Protected Well" (huh?) . . ."
The target market won't know what "artesian" means. The tap water where I am is from an artesian well; big deal. Breinigsville is an economically collapsed mining town that is now basically a warehouse slum of Allentown. Wouldn't surprise me if "Deep protected well" means - tap water. I hear tell there are supermarkets these days that have reverse osmosis machines. You can bring your own bottles and fill them up. No supermarkets around here in the Adirednecks though, so I musta heard it from someone in The City or Kookifornia. I get most of my drinking water by distilling it from the air, then running it through a Berkey. The tap water might well come from a "deep protected well," but it tends to get "enhanced" before it reaches the tap. Yes, I have carried an empty bottle with me for years through the security checkpoint so that I can fill it up from the water fountain. These days I tend to take one with a built in filter. Much cheaper. KFG and WML...thanks for your comments. These days I drink almost exclusively tap water. I used to use a filter, then I wouldn't change it for months on end and wonder if it weren't doing more harm than good. To be honest, some days I worry more about the old pipes it's coming through than the initial water quality itself. And someone on my Facebook page commented about bringing an empty bottle past airport security then filling it from the tap...that is my next move. Thanks! "These days I drink almost exclusively tap water." So long as they don't do a rat study on your water you ought to be fine. Most dietary/environmental health hazards are caused by rat studies.